I uploaded to Wikimedia Commons free illustration ready to use and also free concept-art I did for Sintel / Chaos&Evolutions / Blend&Paint / Tears Of Steel and other open project. The files were uploaded in the highest resolution I have and in lossless compression. The artwork were released with open license, such as CC-By or CC-By-Sa . I did it on the request of someone who wanted to have an overview of my open artwork done. For sure, it wasn't easy with time to search for them inside my blog. Now exist a central place to host and watch them. I'll update it. ...Feel free to use according the license ! Note : Thanks Wikimedia Teams for the hosting. 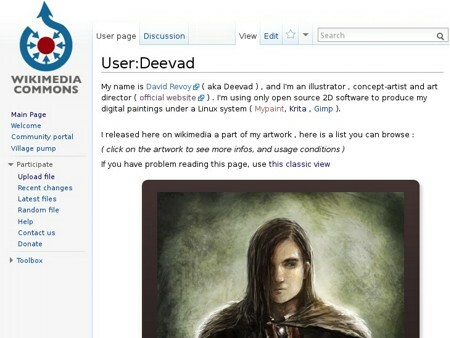 License: CC-BY David Revoy, www.davidrevoy.com, 8 november 2012 . Thanks for uploads! I've created category "David Revoy" (https://commons.wikimedia.org/wiki/Category:David_Revoy ) on Commons some time ago -- you could put your uploads there. But note that Wikimedia Commons has tight rules on the content - it should be in some way educationally useful, not just artistic (of course, concept art created for a notable movie should qualify as educationally useful). Nice art. Think so new form of features have included in your art. Waiting for your next art.